Honor has lambasted the most expensive smartphone in the Apple line-up, heaping scorn on the iPhone XS Max. During the global launch of its all-new Honor View 20, which was held in Paris earlier this afternoon, Honor directly compared its new handset against the £1,099 ($1,099) Apple smartphone not once but multiple times. Honor President George Zhao called out the notch design of the 6.5-inch OLED rival, which he said restricts the amount of information visible on screen at any one time. In a side-by-side comparison, the Honor President used a first-person shooter title as a example of how the notch in the iPhone XS display could hide the location of some enraged AK47-wielding enemies. In contrast, the Honor View 20, which has a hole-punch style display with a 4.5mm circular cut-out to house the front-facing camera, would allow players to see more of the in-game world and therefore dodge the incoming attack from the gun-toting fanatics. Honor welcomed the iPhone XS Max on-stage again to mock the notch design with a photograph of a lighthouse viewed in portrait mode. The top of the tower was clearly visible on the Honor View 20's 6.4-inch screen, thanks to the front camera being safely nestled in the hole-punch in the top left-hand corner of the screen. Whereas the iPhone XS Max, which houses its selfie camera and Face ID facial recognition system in that pesky curvaceous notch, was unable to display the top of the picturesque lighthouse. Of course, you could always pinch to zoom-out. 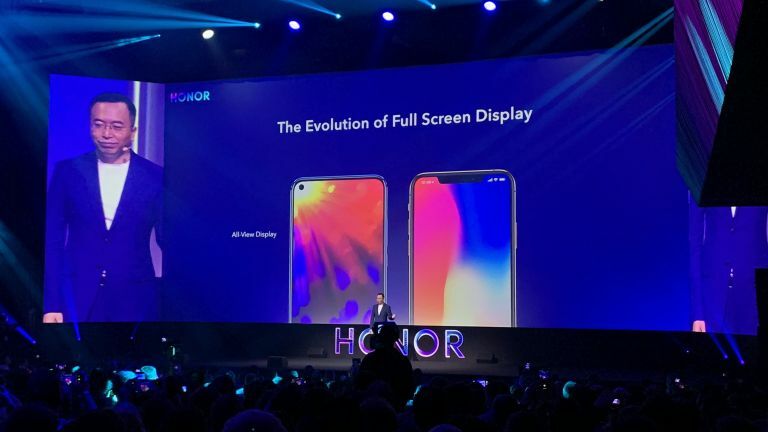 However, Honor President George Zhao didn't let that stop him telling the packed Salle Pleyel auditorium and online audience watching the livestream just how much better the Honor View 20's design was at showing more content on-screen compared to the iPhone XS Max, which has a slightly bigger screen. Honor President Zhao brought-up the iPhone XS Max one final time. Comparing the GPS accuracy of the flagship Apple handset with the £499 Honor View 20, Zhao claimed the latter was accurate to within 15-metres, whereas the iPhone XS was only a whisker better than the industry standard 30-metres. Honor View 20 is able to simultaneously receive GPS signals from two GPS systems to locate where you are. As well as the dual-band GPS, Honor uses its own in-house AI GPS Satellite Selection technology to enhance the accuracy of its readings – particularly in urban areas, by detecting when your signal could be obstructed or sent awry by a bridge, or other man-made structure, the company says. T3 will have a full in-depth review of the Honor View 20 in the coming days, so stay tuned for the definitive verdict on that All-View display and whether Sir Jony Ive and co. need to be losing sleep.